Bruce Forsyth and Tess Daly present a very special Christmas spectacular, with six brand new celebrities taking up the ballroom challenge on a festive-themed dance floor. It's mince pies at the ready as Bruce Forsyth and Tess Daly present a very special Christmas spectacular, with six brand new celebrities taking up the ballroom challenge on a festive-themed dance floor. 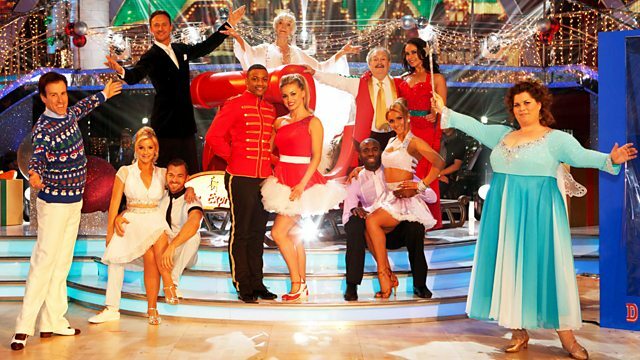 Actress Sheila Hancock, comedian Katy Brand, JB from boyband JLS, Blue Peter's Helen Skelton, comedy performer Bobby Ball and retired footballer Fabrice Muamba all rock around the Strictly dance floor hoping to take home the Christmas Strictly trophy. Some very familiar faces from Strictly's past also join in the festive fun. Plus music legend Rod Stewart wishes everyone a Merry Christmas as he sings in this Christmas cracker.